A 1-year-old reads to an infant at Palmetto Preschool in Myrtle Beach, S.C. Programs that incorporate the concept of continuity of care keep primary caregivers and children together throughout the three years of infancy period, or for the time during that period of the child’s enrollment in care. Discussions of continuity of care often raise the question of safety for younger children who are in the same class with older ones. As you can see, this little guy is modeling what he has experienced to his younger classmate. Continuity of care is not only beneficial for the individual child with their care teacher, but also for the development of interactions with other children. 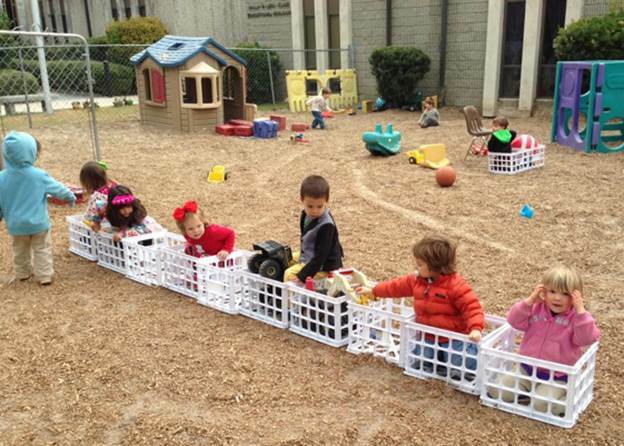 Children at Columbia Jewish Day School in Columbia, S.C., demonstrate a great idea for outdoor play. After viewing a PITC video, the school added milk crates to their playground. Children of all ages enjoy finding creative uses for the crates at this play area. 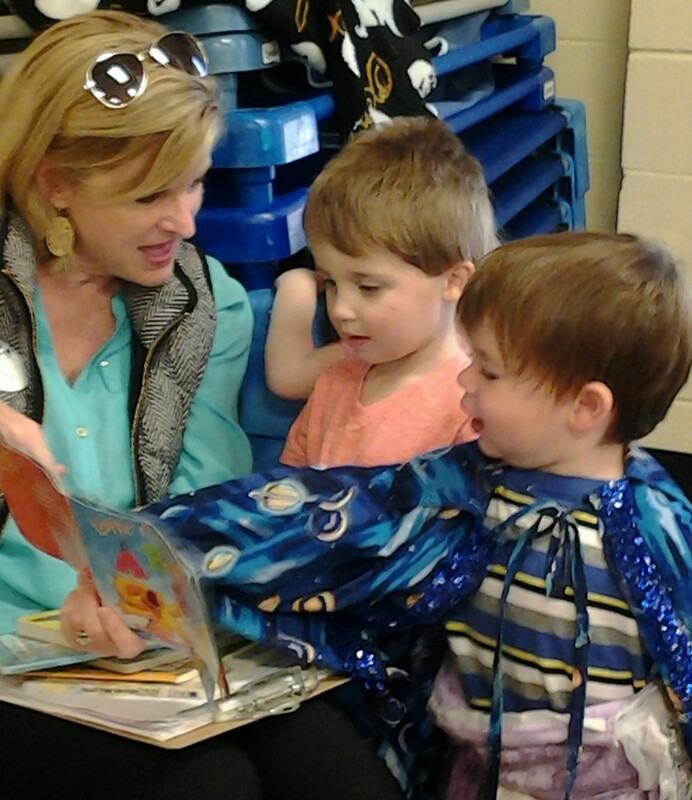 Sharing books, telling stories, engaging in pretend play, singing songs and talking with young children are all engaging activities that can help develop language and literacy skills. Michele Martin, SCPITC infant/toddler specialist and speech-language pathologist, demonstrates how fun this can be in a toddler classroom at Columbia Jewish Day School in Columbia, S.C.
Sensory experiences are very important for young children. In Wanda Greene's 1-2-year-old room at ATM Daycare in Longs, S.C., the sand table is used daily. Here, children are playing at catching fish. Using the children’s experiences with family members and fishing, Wanda extended learning through play. 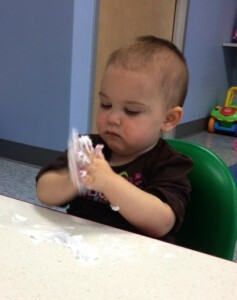 A soapy material turns playtime into exploration time at Palmetto Preschool in Myrtle Beach, S.C. Guiding children in exploring the material helps children discover the world around them by using all their senses. 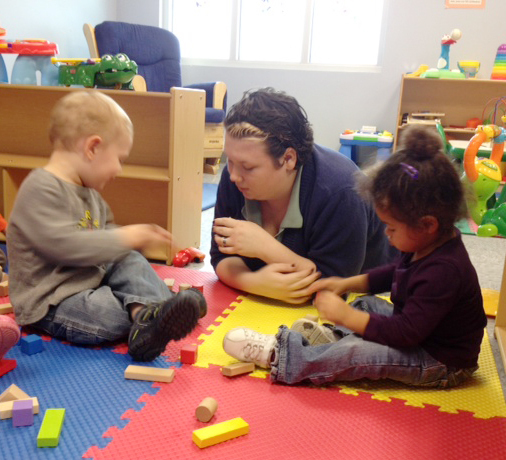 SCPITC’s Infant/Toddler Specialist Jenn Adams works with Palmetto Preschool to encourage activities like this one. 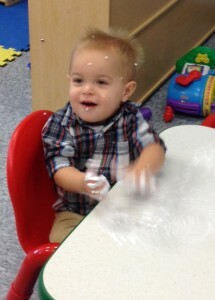 One-year-olds at Palmetto Preschool in Myrtle Beach, S.C., play with a soapy material as a sensory experience. Care teachers guided the children in exploring the material, encouraging the children to feel and smell it. Activities like this are part of SCPITC’s philosophy of engaging children in exploring the world around them. Care teacher Katie Pryor guides children playing with wooden blocks at Palmetto Preschool in Myrtle Beach, S.C. By getting in the floor at the children’s height, she was able to encourage them to explore the blocks and identify shapes and colors. These techniques are part of SCPITC’s recommendations for encouraging development in infants and toddlers. 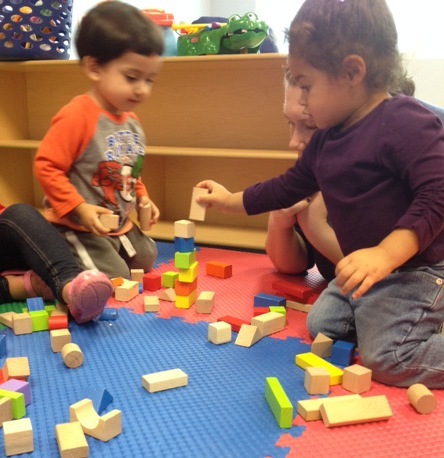 Practicing stacking blocks in the one-year-old classroom at Palmetto Preschool in Myrtle Beach, S.C., children are encouraged to learn and explore their environment by care teacher Katie Pryor. 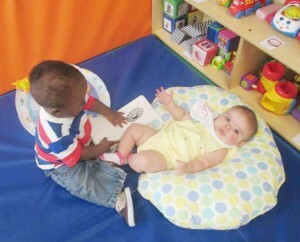 SCPITC works with Palmetto Preschool to provide teacher training on how to best care for infants and toddlers. 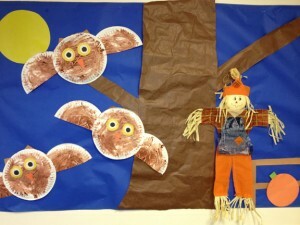 This fun fall display was made by toddler teacher Santana Wise from some of her children’s creative finger-painting artwork to help the children learn about different seasons. 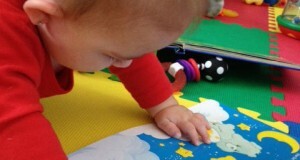 The classroom is at one of SCPITC's participating programs, the Big Blue Marble Academy in Leesville, S.C.
An infant plays with a colorful book at Hunter's Ridge Child Care Center in Myrtle Beach, S.C. Toddlers at Columbia Jewish Day School in Columbia, S.C. 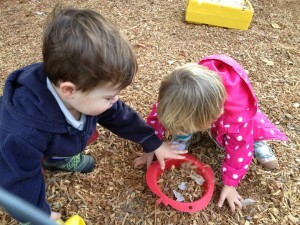 Toddlers at Columbia Jewish Day School in Columbia, S.C., enjoy playing outdoors. 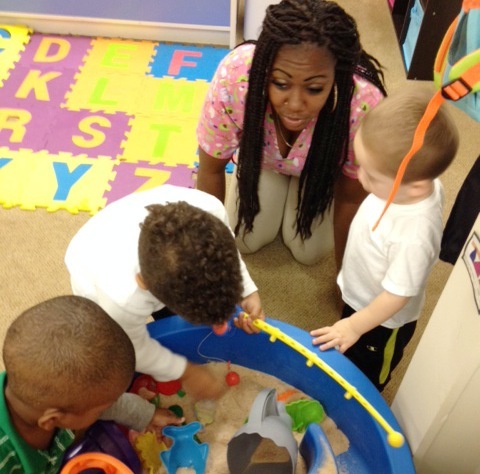 Anna Zimmerman, careteacher at Hunter's Ridge Child Care Center in Myrtle Beach, S.C., interacts with infants in her colorful classroom. The center is receiving SCPITC training that provides information on infant and toddler care and development, as well as in-classroom coaching. 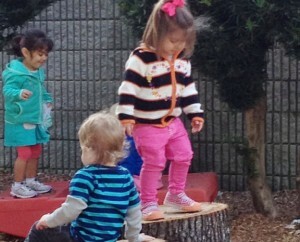 These toddlers at Columbia Jewish Day School in Columbia, S.C., are engaged in fun outdoor play while also developing motor skills, social skills, language and communication and cognitive skills. Renata Stewart, infant care teacher at the YWCA of Greenville, S.C., schedules daily outdoor play with her infants to work out their large muscles in fresh air. She is a S.C. Teacher Mentor through SCPITC. Andrale Robinson of St. James Learning Center in Conway, S.C., sits with two infants at their new table purchased with a SCPITC materials grant. Prior to getting the new table, she was using a bucket-style feeding table that restrained the children’s’ movements. It is that important infants have child-size furnishings to promote their independence and help them develop. The environments training offered by SCPITC provides information on materials that enhance infant and toddler development. 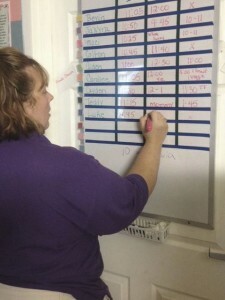 Rhenan Harvey, care teacher at The Learning Station in Conway, uses a whiteboard to chart the individual needs of the infants in her care. The board allows anyone in the room to know what is needed and when so the infants are always on their own schedule, rather than having to conform to a group schedule. The Learning Station also uses daily written care sheets that they share with the families of children in their care. 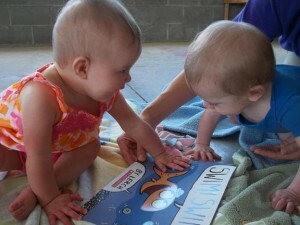 Infants explore a book during outside play time. Babies play outside every day, weather permitting, at the Learning Station in Conway, a center that participates in SCPITC training. Care teachers Jackie Cain, left, and Ali Tobin examine the space and materials in the 2-year-old play area at the Learning Station in Conway as part of their SCPITC training on environments for infants and toddlers. As part of a study of infant environments, care teachers explore their rooms from an infant and toddler perspective. 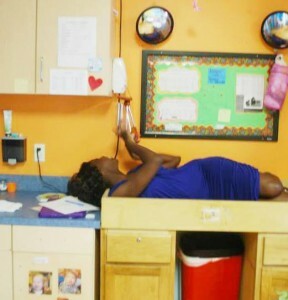 Care teacher Kayla Green of the Learning Station in Conway tries out the changing table, noting that she now understands why some children are frightened by the height of the table. Care teachers in the busy 1-year-old room at the Learning Station in Conway explore the room from a child’s perspective to learn about child care environments. Care teachers, from left, are Kayla Green, Gail Poston, Codi North and Heather Kirby.